The IRS Raid That Failed To Close SAPF! Save-A-Patriot Fellowship: The organization that successfully withstood an IRS raid (December 10, 1993), and prevailed against the IRS in the Federal District Court, December 18, 1996, Case No. MJG-95-935. The Department of Justice appealed the Federal District Court's Judgement to the United States Court of Appeals for the Fourth Circuit, Case No. 97-1303, and on March 13, 1997, filed with that Court a Motion for Dismissal of Appeal -- with prejudice. Case closed!!! On December 10, 1993, the Internal Revenue Service conducted a raid on the offices of SAPF in Westminster, Maryland. The Save-A-Patriot Fellowship is a first amendment association dedicated to encouraging, not only citizens, but employees of the government (specifically IRS personnel) to obey the laws that Congress has written. Members of SAPF recognize the necessity of taxation (i.e. raising of revenues) but we also recognize that this necessity has provisions in the law and that the government, in meeting its exigencies, may not extend its activities beyond the law. The Fellowship promotes the study of the law and the assertion of ones rights in accordance with the law. Since it does not object to any tax, income or otherwise, it is NOT a "tax protest organization." If SAPF protests anything at all, it protests violations of the law by government employees who exceed their legal authority in the administration of law -- there is a big difference. Such violations reach the highest positions in government. Unfortunately, for whatever reason, they do occur, and the judicial branch of the government is no exception. Members of the Fellowship believe that the time has come for the people of this country to insist that their government obey the law, and that this includes the IRS. Save-A-Patriot researches the law and informs its members through its newsletter, of recent findings and events pertaining to what has just been mentioned. As you know, the right to engage in this method of communication is guaranteed by the first amendment of the United States Constitution, and as such, it does not require the permission of government. Our ongoing research and experience in the area of taxation, combined with the government's recent actions, would seem to indicate that those in positions of authority within the IRS believe that the laws enacted by Congress have some other meaning than what is clearly written. We have suspected for some time that there were many misperceptions within the IRS as to the purpose and goals of SAPF, and that under the circumstances it would be appropriate to explain our position in order to ensure that it was not misrepresented either in the public forum or certain branches of the IRS. To accomplish this, we wrote to the Acting Commissioner of Internal Revenue, Michael Dolan, on July 19, 1993, expressing our concern. In that letter we extended an invitation to the Commissioner or any of his designates to visit our office and observe first-hand our activities. The same invitation was extended to all of the federal judges and magistrates in this district, and public notice of the invitation was printed in the Carroll County Times, a local newspaper, on three consecutive Mondays. We were glad to see local Federal Magistrate Paul M. Rosenberg respond to our invitation and comment that we were doing an "admirable job." So on October 27, 1993, we wrote to the new Commissioner of Internal Revenue, Margaret Milner Richardson, and repeated our invitation. This time, because of our growth and increasing prominence, we even suggested a permanent IRS liaison for the office; but instead of any spirit of cooperation, their response was to notify us that the matter was turned over to the Criminal Investigation Division in Baltimore. Magistrate Rosenberg, who was fully aware of our intent, knew of the invitation. Therefore, he also knew that the Fellowship was not "concealing" anything. Nevertheless, on December 8, 1993, Magistrate Rosenberg signed a search warrant stating that, "property is now concealed on the premises... and if the ... property be found there to seize same." After making every effort to communicate our purpose and extending the above invitation, we were accused of "concealing" something -- of what we are not sure. The fact is, we believe that the IRS had ulterior motives. Since the Fellowship documents the systematic denial of due process in the various assessment and collection procedures and the fraudulent practice of various IRS agents, it is entirely possible that the seizure of such documents was intended to thwart the association's investigations into such affairs; in other words, to cover up corruption at the highest levels. The public should call for an investigation by the Justice Department into the circumstances surrounding the warrant and subsequent raid, rather than to tacitly assume that the individuals responsible for this "raid" are above reproach. The events leading up to the raid would further seem to support this hypothesis. They began on December 1, 1993, when John B. Kotmair, Jr. the fiduciary of SAPF, was subpoenaed to appear at a grand jury investigation in Sioux Falls, South Dakota. The affidavit supporting the subpoena contained false statements made by an IRS Special Agent, so Mr. Kotmair naturally notified the Court to inform them of the defect. Nevertheless, the Federal District Court of South Dakota insisted that he appear in Sioux Falls on December 9, 1993, to testify. During his testimony, he provided the Grand Jury with copies of the documentation showing the perjurous statements of the IRS Special Agent. The US Attorney conspired with the perjurous Special Agent in an obvious attempt to obtain the indictment against Mr. Kotmair. Also during the proceedings, the U.S. Attorney asked Mr. Kotmair, "isn't it true that anyone who disagrees with an IRS assessment can pay the tax and then sue for a refund in court?" The implication was that Mr. Kotmair was "selling" the public false information in the form of a "non-existent legal remedy." Mr. Kotmair responded by explaining to the jury that suing for a refund was only ONE option. He said: "If the IRS claimed you owed a million dollars, could you afford to pay the tax and then sue for a refund? How about $250,000? What about $25,000? Could you afford to pay $25,000 and then sue for a refund?" He then gave them a brief history lesson and explained that during the War Between the States, Congress passed the Anti-Injunction Act that prevented the courts from enjoining (stopping) the collection of a tax. He told them that because of this Anti-Injunction Act, a bureaucrat could literally pluck a figure out of thin air, (like a million dollars) claim you owe it, and there would no judicial remedy because the courts no longer had jurisdiction over such matters. Then he explained why the U.S. Attorney was wrong and cited "the other option under the IR Code" (i.e. Section 6404) -- the section that the IRS does not like to talk about! He explained that people with errant assessments have an administrative remedy that the IRS was ignoring and/or denying in violation of due process requirements, and then he explained that he assisted people in pursuing this administrative remedy and in requesting abatements if and when they believed an assessment had been made in error. There was no need to go through the expensive and often prohibitive process of appealing to a tax court. He added that he had helped thousands of people and that at the present time he was helping a 72 year old man in Alaska who had never even paid him a dime! The grand jury evidently agreed with the information that he provided and did NOT hand down the indictment that the IRS expected. He was able to take a late flight home and arrived just in time for the scheduled raid at SAPF shortly after 9 AM the next day (December 10, 1993). The whole affair reeks of shame, and the alleged liability of Mr. Kotmair appears to be nothing more than a ploy designed to make the IRS's actions palatable to an increasingly suspicious public. They no doubt hoped to make a public spectacle out of the indictment and subsequent raid. As to what actually happened -- one of our caseworkers had already arrived at the office and was busily working at his computer. Hearing a noise from behind, he turned around only to find four 9-millimeter semi-automatic handguns pointed at his head. In a calm, quizzical voice he asked, "What seems to be the problem?" As luck would have it, this particular SAPF staff member was a former treasury agent himself, and by the purest of coincidences, he was wearing his personalized "treasury" jacket. The swat team was intimately familiar with the apparel and immediately asked him where he had obtained it. Our staff member replied, "I used to be one of you boys until I learned the truth!" He was promptly ordered out of the building with his hands on his head. Federal agents then began to sort through the Fellowship's property and loaded it onto trucks. To show just how ridiculous the raid was -- the computers stored data and information pertaining to correspondence that had been sent to the IRS. Considering that the IRS already had copies of these documents, and considering the costs involved with performing the raid (and how much our subseqent litigation cost the IRS in terms of money and embarrassment), we just cannot fathom why some IRS special agent was "stoopid" enough to bring on all of the problems that this raid ultimately caused the agency. It may be that the raid was to be the "icing on the cake" to the indictment that never came down, and that someone forgot to inform the Baltimore IRS to call off the raid. But regardless, it should be pointed out that the warrant only authorized the seizure of property belonging to Kotmair -- NOT Save-A-Patriot. Mr. Kotmair is only the fiduciary for the association. He does not own the property. Therefore, since the warrant specified only property belonging to Kotmair, the Save-A-Patriot property that was taken, was taken illegally, regardless of whether the warrant was justified or not. Unfortunately, the travesty of justice doesn't stop there. At the same time as the raid on the office, agents forcibly entered Mr. Kotmair's home with weapons drawn. His wife was in her nightgown and turned to get her bathrobe to open the door after she heard the knocks, but agents immediately smashed the front door in with a sledge hammer before she could get her bathrobe on. His son was asleep and awoke to find a shotgun close to his head. Mrs. Kotmair was not even allowed to change clothes to put on something warmer. Instead, she was confined to a chair near the broken front door with cold winter air coming in on her. After about an hour she was allowed to put on her bathrobe. When she needed to use the bathroom a female agent would go with her and refused to leave for "her own protection" they told her. She observed agents quarreling over what property they would take but was not allowed to be involved in their determination of what was applicable property to be seized pursuant to the warrant. Our people reported that the rude, arrogant, confrontational attitude of the 50 gun-waving IRS agents turned to confusion when they were not met with angry or hostile "opponents." They were apparently given false information of what to expect, quite possibly, to provoke an "incident" which could be used to justify the raid in the mind of the public. A few of Mr. Kotmair's perfectly legal handguns were laid out on the ground and photographed as though to suggest that he was some sort of drug king-pin. This was all part of the public spectacle to justify this travesty of justice, resulting from a faulty warrant and subsequent raid that should have been called off -- all because the IRS doesn't want Kotmair helping innocent people that the IRS wants to destroy, and if you think it can't happen to you, think again! One day you might need the assistance of this group. If anyone needs further proof of the lawful activities of the Fellowship, we will take this opportunity to demand that the government provide a spokesman to publicly defend their own unlawful action. The members of SAPF and John B. Kotmair, Jr., have nothing to hide and will freely disclose any "tax liability" that they may have to anyone. The failure of the IRS to publicly defend their actions establishes the presumption that their activities are either unlawful or that the agency incorrectly believes itself to be above the law and under no obligation to the public. 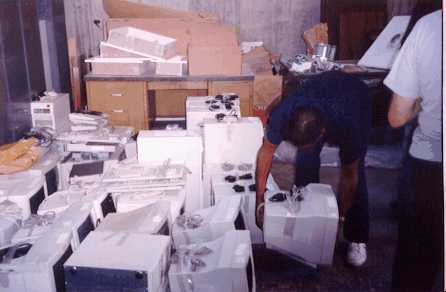 Internal Revenue Service Agents return seized computer equipment to SAPF warehouse. 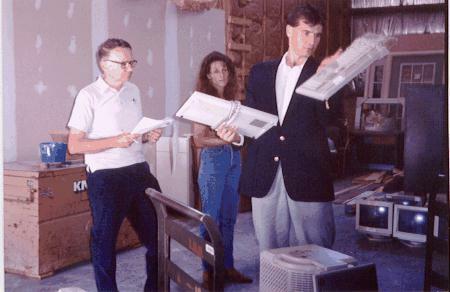 Special Agent Michael O' Hanlon (left), assisted by unidentified IRS agent (right) checks off equipment list, overseen by SAPF staffer (center).